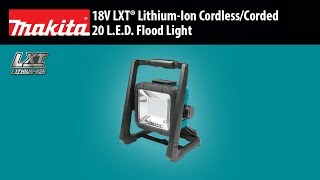 The 18V LXT® Lithium-Ion Cordless/Corded L.E.D. Floodlight (DML805) offers the convenience of cordless or corded operation, and provides bright and even lighting for large work spaces without the high heat of halogens. At full brightness it provides 750 lumens of light, and 450 lumens on low mode. The fast-charging 18V LXT Lithium-Ion 4.0Ah battery (sold separately) delivers 10.5 hours of continuous illumination on a single charge. It also features Extreme Protection Technology (XPT™) for improved dust and water resistance. It is fully compatible with Makita 18V Lithium-Ion batteries. Net Weight (with battery) : 6.1 lbs. Shipping Weight : 6.1 lbs.